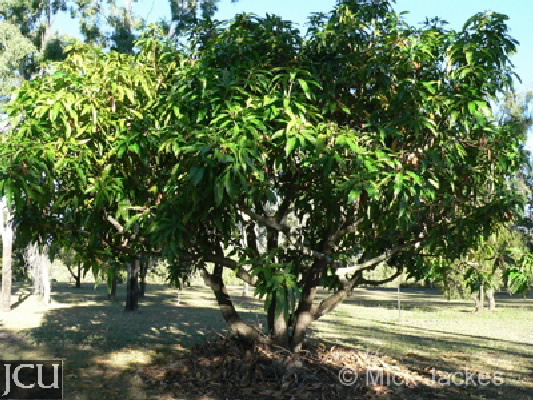 Originally from Asia several mango trees can be found on campus. A mature tree has a large dense green canopy with flushes of new growth appearing periodically. This new growth is reddish-brown or coppery in appearance. 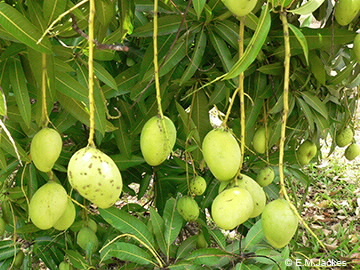 The small, white flowers are borne in panicles, the fruit is a drupe. Flowering spring, fruiting usually about November but there is great variation and depends on the season and cultivar. This plant is a relative of the North American poison ivy and contains similar toxins. This resin is released when parts of the plant are broken and may produce a reaction in susceptible people.